A young deputy sheriff goes to law school to become the peoples lawyer. Then teams up with some sharp cops to tackle crime, first in his community and later nationally. Each step brings controversy as he progresses from county prosecutor to U.S. Attorneyto Director of the U.S. Marshals Serviceultimately to Federal District Judge. Youll be shocked to learn how one prominent person tried to tube his career! 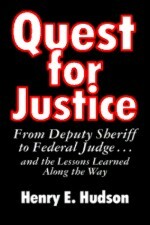 Greta Van Susteren of Fox News says crime news junkies will love Quest for Justice, . . . a thrilling tale of crime fighting adventure. And Ollie North says, Henry Hudson weaves a suspenseful tale that reads like a novel, but its all true. An insiders view of the world of criminal prosecutionthe good and the bad. He really strips the varnish off. Very entertaining! The rugged, thinly populated territory occupying the panhandle of Idaho is a paradise for those who love the outdoors. The air is crisp. Trout fill the mountain streams. Wildlife abounds in the endless pristine timberland. Snow graces the mountain peaks most months of the year. Life in this region lacks rigidity and structure. Time is measured in terms of productive daylight hours. The inhabitants like it that way. Thats why they live there. The panhandle area has a reputation for harboring those seeking freedom from urban frenzy, oppressive government, unwanted family ties, and often, the law. Naples, Idaho, is situated within Boundary County about forty miles from the Canadian border. Mountainous and in places desolate, Boundary County offers residents comparatively simple life, built on a bedrock system of time-tested values and traditions. Staunchly conservative, folks from Boundary County resist government in their lives, and distrust its representatives, particularly those who threaten their way of life. The outdoors plays a central role in their bucolic lifestyle. It is said that people from Northern Idaho learn to shoot before they learn to walk. Whether that is true or not, one things for certain. People in Boundary County believe the Second Amendment to the U.S. Constitution gives them an inalienable right to own and use firearmsof all types. No right is more fundamental, no notion is more commonly held. You wont find any industrial plants, military bases, or business parks in Boundary County. Its nine thousand or so residents live off the landfarming, hunting, fishing, or trapping. Theres a special sanctity to their land. Poaching or trespassing can be hazardous. Folks prefer self-help legal remedies to anything the law could provide. But it would be unfair to call these people lawless. Law to them is a social contract to live and let live; not governmentally pronounced and enforced rules of conduct. Boundary citizens are proud of their independence. They neither request nor expect any form of assistance from the federal government. They live by a simple creeda government that governs least, governs best. Why would the Bureau of Alcohol, Tobacco and Firearms (ATF) be interested in a man who lived in virtual isolation with his family on a mountainside called Ruby Ridge? That was a question Randy Weaver and his family continually asked, as did his neighbors in Boundary County, Idaho. In time, the same question would be asked by U.S. Marshals. In December 1990, Randall Weaver was indicted by a federal grand jury in Idaho for allegedly selling two sawed-off shotguns to a confidential informant, working under the direction of an ATF agent. According to the indictment and related documents, Weaver sold the undercover operative a Harrington and Richardson .12-gauge single-shot shotgun with a barrel cut to thirteen inches. The gun measured a total of 19.25 inches. In addition, Weaver provided the agent a Remington .12-gauge pump action shotgun with a barrel cut to 12.75 inches. This weapon had an overall length of 24.5 inches . . .